This video shows the transition of a shingle roof to a metal roof. The most trusted Miami roofing contractor professionally describes the installation of this metal roof., Joe starts the transition process with a Versa shield, 24 Gague Galvalume Standing Seam 1.5 & Mill Finish color. Joe states that the owner disliked the shingle roof and also mentions how the electric seamer works when getting the panels properly fastened with the ridges placed with J channel. This video demonstrates in full detail what the most successful Miami roofing company, Istueta Roofing, will do to this roof. The processes involved in this reroof range from flashing, the sealing process, the valleys and the installation GAF Timberline High-Definition Lifetime White Shingles. The most qualified roofing contractors in Miami, FL explain how properly waterproofing the details of your Miami, FL roof will create an investment in your home instead of an expense. Your Miami, FL roof will have a longer life expectancy if these proper installation methods are applied. This video explains the proper way to install shingle roofs with more detail in Coral Gables, Miami, FL. This video explains the process of how to properly install shingle roofs in Coral Gables, Miami, FL. 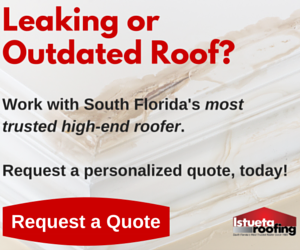 If you’re interested to learn more about what Istueta Roofing can do for you and your home, click the button below to request a customize quote from South Florida’s most trusted roofer since 1985!